Team logo decals are displayed on the shell. Team: Tennessee Titans. Display Cases. He won the Heisman while at Alabama. ATHLETE: Derrick Henry. COA: Steiner Sports and GT Sports Marketing. TEAM: Tennessee Titans. The authentication is from JSA. This signature is authenticated by a representative of JSA! 100% AUTHENTIC! It is a great item and a must for all great sports fans! GTSM has the exclusive autograph contract with Marcus Mariota. The autograph was witnessed authenticated by a JSA representative as part of their "witness protection program.". GTSM has the exclusive autograph contract with Derrick Henry. Witness JSA (Witness Protection Program) and GTSM Authenticated. I obtained the signature in person and its 100% authentic. This is a Tennessee Titans Riddell mini helmet that has been personally signed by Jevon Kearse with The Freak inscription.This helmetincludes a certificate of authenticity from Beckett Authentication and Denver Autographs._x000D_. This is a hand signed Tajae Sharpe chrome mini helmet. This was signed in 2018 before a game by the titans star player. He is one of the top young players on the titans and will be one of the main reasons why they turn things around and win games. They will be making a run towards the playoffs and beyond. This is a great chrome helmet that is super rare and signed in white paint pen. This helmet is an absolute must have for any fan or collection. This helmet comes with a coa and shipping is 11.00. Any questions please ask. GTSM has an exclusive signing contract with Marcus. A must have piece for any Marcus Mariota, Tennessee Titans, Oregon Ducks, NCAA or NFL fan/collector. Marcus signed it with a black sharpie. We have several of these and you will receive one that is of equal quality. ATHLETE: Javon Kearse. COA: JSA Witness. TEAM: Tennessee Titans. This is a hand signed Marcus Mariota 11x14 photo. This is a one of a kind custom edit. Marcus is one of the top young quarterbacks in the nfl and will be for years to come. He won the heisman trophy when he was at Oregon. He is gonna be one of the main reasons why they get back to the glory land. This is a great item and an absolute must have for any fan or collection. This item comes with a coa from psa/dna and shipping is 8.00. Any questions please ask. This is a custom Taylor Lewan autographed full size Tennessee Titans end zone pylon. We include a photograph proof photo of the athlete/celebrity signing for us, in most cases, signing the EXACT item for sale. He won the Heisman while at Alabama. ATHLETE: Derrick Henry. TEAM: Tennessee Titans. CONCEPT: Tennessee Titans oversized sword alternate logo. He won the Heisman while at Alabama. ATHLETE: Derrick Henry. COA: JSA Witness. TEAM: Tennessee Titans. 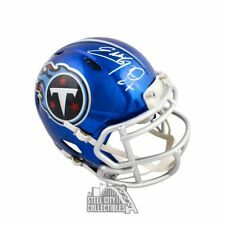 JEVON KEARSE SIGNED F/S RIDDELL REPLICA HELMET JSA WITNESS COA TITANS. The Certificate of Authenticity is from By Design Sports (BDS). The autograph was witnessed authenticated by a JSA representative as part of their "witness protection program.". GTSM has the exclusive autograph contract with Marcus Mariota. JSA #WP967600. The item must be in the condition that it was received. RASHAAN EVANS SIGNED CUSTOM JERSEY. • Jersey is signed in SILVER sharpie! RASHAAN EVANS SIGNED CUSTOM JERSEY. • Jersey is signed in BLACK sharpie! UP FOR SELL IS A TENNESSEE TITANS MINI HELMET SIGNED BY TITANS WIDE RECEIVER COREY DAVIS. DAVIS HAS THE POTENTIAL TO BE ONE OF THE BEST RECEIVERS IN THE NFL AND IS ONLY GOING TO GET BETTER AT TENNESSEE. HIS AUTOGRAPHS ARE VERY SCARCE SO GET THIS WHILE YOU STILL CAN. THIS IS A MUST HAVE FOR ANY TITANS FAN. THIS MINI HELMET WAS SIGNED WITH A BLACK PERMANENT MARKER. THIS WAS SIGNED RECENTLY. ALL AUTOGRAPHS COME WITH A COA FROM RACKCITY2210 TO ENSURE YOU THAT THE AUTOGRAPH IS 100% AUTHENTIC. ALL AUTOGRAPHS ARE GUARANTEED TO PASS ANY AUTHENTICITY TEST OR MONEY BACK. THANKS. Original hand signed by Eddie George. It's not a copy or reprint. A Perfect photo for any collection. Another great photo brought to you by All About Sports Plus Framing.